I’ll never forget the Christmas when I got a bright yellow Gameboy and Pokémon Yellow; my life changed a little. Flash-forward 17 years and I’m still hooked. Pokémon has been a household name since its release in the 1990’s, but the latest installment in the franchise has taken a different approach: The worldwide sensation Pokémon Go is free, and is making local businesses money. Since the release of Pokémon Go in early July, local businesses and non-profit organizations have generally seen an increase in sales and traffic to their locations. This isn’t hard to believe, since the game requires players to walk, jog, or bike around to find Pokémon. A video game that is getting young adults off of the couch and exploring the world? Inconceivable! 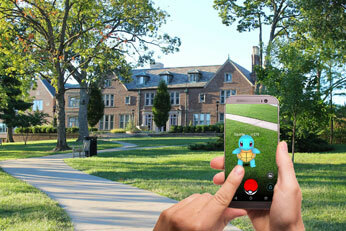 The game not only encourages physical activity, but also rewards players for traveling to different locations, known as Pokéstops. I’m typing this up at the Henry Vilas Zoo, and I can see more than 15 stops from my current location. Not that I needed extra incentive to walk over to the tiger cage, but free in-game items are a plus. Pokéstops are linked to real world locations, so the game is essentially giving parks, churches, and some businesses free publicity. Because of this, small town shops and parks previously unnoticed have become hotspots for eager trainers of all ages. For example, I’d never noticed how many historic landmarks Sauk City’s main street had until I started exploring. And those texts I get from my brother telling me there’s a Pikachu hanging out by the antique store? That’s free word-of-mouth advertisement for local businesses. Thanks Pokémon! Businesses with Pokéstops nearby have been using in-game lures as a sales strategy, which not only draws in Pokémon, but the trainers hunting them as well. A lure lasts for 30 minutes, so people tend to stay in the vicinity until it disappears. Restaurants in particular have taken advantage of this, by placing lures at their business so customers can try their food and catch Pokémon at the same time. Every day I stop at Culver’s in Sauk City, there is a lure present and gamers huddled around their phones. Others have created special Pokémon themed menu items to catch the attention of players who are walking by. In my hometown, the local animal shelter hosted a special Pokémon lemonade stand, with three choices based on your team color: yellow, blue, or red. The proceeds went to helping the animal shelter, and the stand helped hydrate the gamers walking around on that hot day. This game is truly a win-win situation if you know how to use it. While there have been some gripes about the Pokémania that has taken over the world since this game launched, I truly believe it is creating more positive change in the world than harm. In the few months since the game has launched: I’ve traveled to new places, walked an extra 30+ minutes a day, and given my money to businesses I wouldn’t have otherwise frequented. If you haven’t already, I encourage you to check it out. Pokémon is the latest marketing trend, and an opportunity to engage with your audience in a fun and interactive way; Don’t miss the opportunity the game provides, and consider using it for your latest business campaign. For more ways to successfully use Pokémon Go to help your business, read this article.